The iPhone 6s has finally been unveiled by Apple, the question on everyone’s mind is how does it compare to Samsung Galaxy S6? The rivalry between Apple and Samsung’s flagship smartphones is closer than ever this year, as the iPhone 6s gets a significant front and rear camera upgrade to bring it within touching distance of the Galaxy. Samsung has the upper hand as far as screen size and resolution are concerned, however Apple’s 3D Touch technology, could win over consumers already using Force Touch on the Apple Watch and new MacBooks. Opting to stick with 16GB of storage for the base model could pose a problem for Apple, as the Galaxy S6 starts with double that. 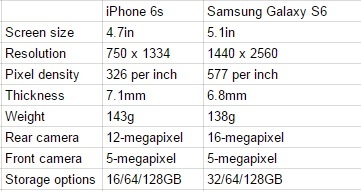 Comparing the processors of the Samsung Galaxy S and iPhone range has always been like comparing apples with oranges. For starters, Apple never discloses the clock speed or number of cores – or how much RAM each iPhone has – and Samsung has recently moved to outfitting flagships with its own chips. All we can say is the Galaxy S6 uses an octa-core processor with one quad-core chip running at 1.5Ghz and a second running at 2.1GHz. The iPhone 6s uses Apple’s A9 processor, and while we don’t know any of its technical specifications, we do know that it’s 70% faster than the A8 found in the iPhone 6. Force Touch is the biggest difference here. New for the iPhone 6s , Force Touch is a way for the screen to know how hard you are pressing on it. The technology has previously appeared on the Apple Watch and new MacBooks, and will give application and game developers a whole new set of gestures to work with. For the size and resolution of their displays. 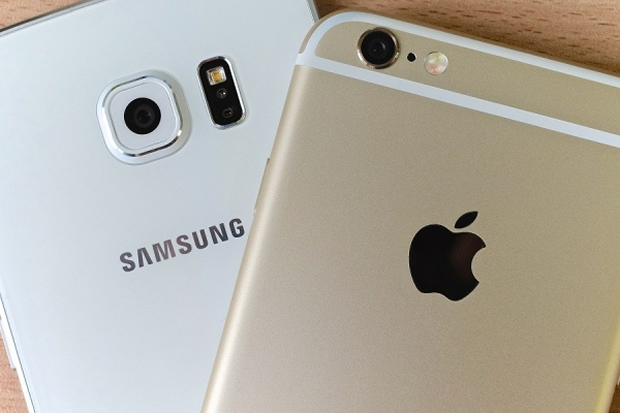 As usual, the Samsung is larger at 5.1in compared to the iPhone’s 4.7in, the same as the year-old iPhone 6. Samsung also has a greater resolution, at 1440 x 2560 compared to the iPhone’s 750 x 1334. Following a recent price cut, the Galaxy S6 starts at £499 (down from £559) on Samsung’s website, rising to £639 for the 64GB model and £719 for 128GB. The iPhone 6s opens for preorder on 12 September, goes on sale on the 25th, and will cost £539 for the 16GB model, £619 for 64GB and £699 for 128GB. Monk Defies Science, Running Across Water!